For Color Coded Padlocks you've come to the source!! We have Aluminum Color Coded Padlocks with standard colors, plus Aluminum or Brass Padlocks with our highly distinctive, colorful Color Coded Sleeves factory-installed. Our padlocks are all corrosive and weather resistant for all industrial environments, and satisfy OSHA's lockout regulations. Color Coded Padlocks are essential tools for identifying various departments or trades involved in a large-scale lockout. All of our padlocks are available with either 1" or 3" shackles, and may be ordered Keyed Alike, Keyed Differently, or Master Keyed. 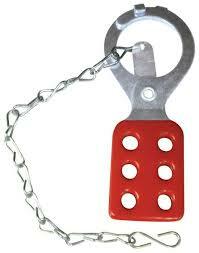 These are the perfect choice to ensure compliance with OSHA lockout requirements. Idesco Safety - the industry choice for Color Coded Padlocks! Choose our anodized, solid body Aluminum Padlocks when you need economical, durable, weather resistant, lightweight padlocks. 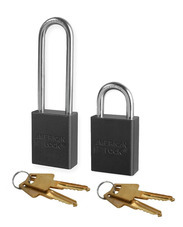 These top-selling Aluminum Padlocks have a gun-metal blue finish and are case-hardened. Features include a plated steel shackle, steel double ball locking mechanism, and a 5-pin non-rekeyeable cylinder. These rugged padlocks are corrosion-resistant and won't break down even in harsh or caustic environments. 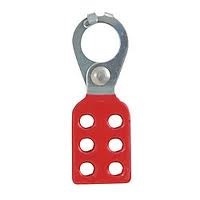 They’re the perfect choice to ensure compliance with OSHA lockout requirements. All of these padlocks are available with either 1" or 3" shackles, and may be ordered Keyed Alike, Keyed Differently, or Master Keyed. Aluminum padlocks are also available color coded, or encased in our Color-Coded Padlock Sleeves with the legend DANGER, LOCKED OUT. Idesco Safety - the safest choice for padlocks!